AQC Industries, Inc. the leading manufacturer and innovator of The BlueDuct®, sponsored and attended the Building Safety & Design Expo. The expo took place at the Greater Richmond Convention Center in Richmond, VA earlier this week. This expo brought together building safety and design professionals to learn about the latest products and safety standards. Building officials, tradesmen, architects, engineers and many others came to Virginia to experience this expo. The BlueDuct product was the highlight in AQC Industries booth, which also included hands-on product samples and demos. BlueDuct, a direct-burial system, is in thousands of buildings, with proven trouble-free, long-term performance. In addition to AQC, exhibitors ranged from fire and flood prevention to data software platforms. With over 100 exhibitors, every attendee gained valuable knowledge from attending this expo. The AQC team received many compliments on their products from people who have seen them in the field. Many code officials attended the show, introducing them to BlueDuct and AQC Industries. 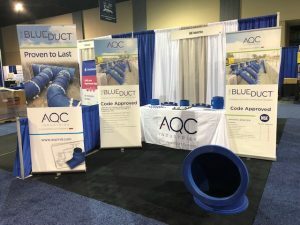 AQC’s Training Manager, Vishal Sookhai attended the Building Safety & Design Expo and shared this highlight, “I was talking with a building code official who told me that the teams he met on site, who were installing the product, could not say enough good things about The BlueDuct.” In addition, the AQC booth also had many customers stop by to share their BlueDuct success stories. Thank you to the BSD expo team for putting together a great event!